Ogol is an Orc warrior found in Largashbur. 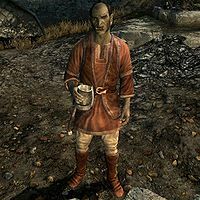 He is easy to spot among the other Orcs as his apparel is more akin to a city dweller than someone in an Orc stronghold. After Malacath's curse is lifted by completing The Cursed Tribe, he will respect you enough to become a follower. He spends his days wandering around Largashbur, not straying too far from the campfire. At night he sleeps with the other Orcs in the longhouse. As compared to other followers, Ogol has one of the smallest default inventories. Wearing only clothes and boots, pretty much anything with an armor rating above 1 is a step up for him. He wields a removable steel war axe, and a hidden hunting bow with iron arrows. During The Cursed Tribe, he will be hostile towards you, stating "Our tribe has survived this long without you interfering. We'll be fine." However, after Yamarz is killed, he will say, "I am... surprised that Gularzob was named chief." or "I will serve Gularzob as best I can, even though I am his elder." He may also declare, "We are all blood here. One family, one tribe." This page was last modified on 24 February 2014, at 22:13.